Budiansky (The Nature of Horses, 1997, etc.) stakes out a middle ground between radical behavioralists and cognitive ethologists in this investigation into the workings of animal intelligence. Modern cognitive science and evolutionary ecology appear to have demonstrated that animals think in complex and wondrous variety, Budiansky suggests, but it is folly to compare their intellectualizations to those of humans. We may be hard-wired to anthropomorphize in our self-centered rush to think, but for now the mental life of animals is beyond our ken, irresistible and yet elusive. Budiansky covers much of the substantive work done in animal symbolic logic, mental imagery, and mental mapping , yet what he finds most compelling, and most accessible, in interpreting animal behavior is the evolutionary intelligence of associative learning and genetically programmed instincts: “It is not as if plovers, as a predator approaches, sometimes fake a broken wing and other times dance the Charleston.” Not that animals haven’t some senses and talents denied to us. Still, why try to confine those talents within the linear scale by which we often measure our own smartness? Obviously, Budiansky reasons, not all animal intelligence is unconscious or automatic, so we may as well drop our political agendas and emotional sympathies masquerading as truth. Instead, he urges us to accept the fundamental differences that can not be dismissed as purely sensory or motor; marvel at the astonishing things that animals can do outside of consciousness as we know it; give them their own space; and appreciate that to experience a horse’s nonverbal thoughts, you would very likely have to be a horse. 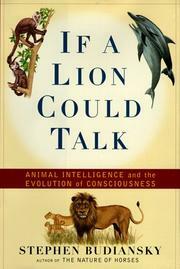 Budiansky is realistic about the human ability to decipher an animal’s thoughts, and he respects animal consciousness. This book is another of those small, indispensable steps that shuffle toward knowledge.